I'm back with another installment of Nails Talk. If you are a regular reader of Nails Talks, Mei Mei's Signatures should not be a stranger to you. What I have for Nails Talk today is a signature nail polish of Mei Mei's Signatures. Love Me More was specially created by Lex Cosmetics for Mei Mei and is sold exclusively on her web store, Mei Mei's Signatures. Love Me More is a bright carnation pink polish with blue and pink micro shimmer, a perfect color for summer and also for Mei Mei cause she's a huge lover of the color pink. To be honest, I don't really have a lot of pink polish, especially bright or hot pinks. Somehow I always find myself drawn towards colors like red, blue and black. The few miserable pink polishes that I have are more soft pink shades. Which was why I was little apprehensive when Mei Mei sent me Love Me More for my review because I did not know if this color would suit me or not. Still, no harm giving it a try cause who knows, I might just fall in love with it. And boy, did I fall head into heels with it. The first impression I had of Love Me More was the unique packaging. The white plastic cap was printed with a black, abstract swirly design and I really love it. It really stands out from the black caps that are commonly used. Bonus points for the square bottle too which makes storage so much easier as compared to the usual round bottles. All photos shown below are taken with a daylight lamp, no flash. Color wise, the bright pink really screams summer and although I'm not a huge fan of shimmers, I got to admit that the blue and pink micro shimmer does indeed adds depth to the color. 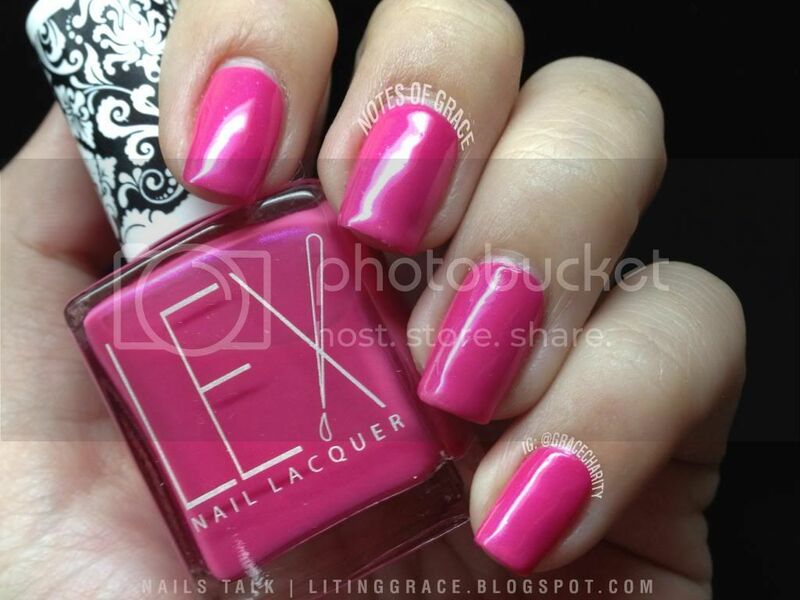 This is one color that makes you feels feminine but not too girly. Formula wise, I had no problems with Love Me More. I needed only two coats to reach opacity and application was smooth and easy like a breeze further scoring extra points! 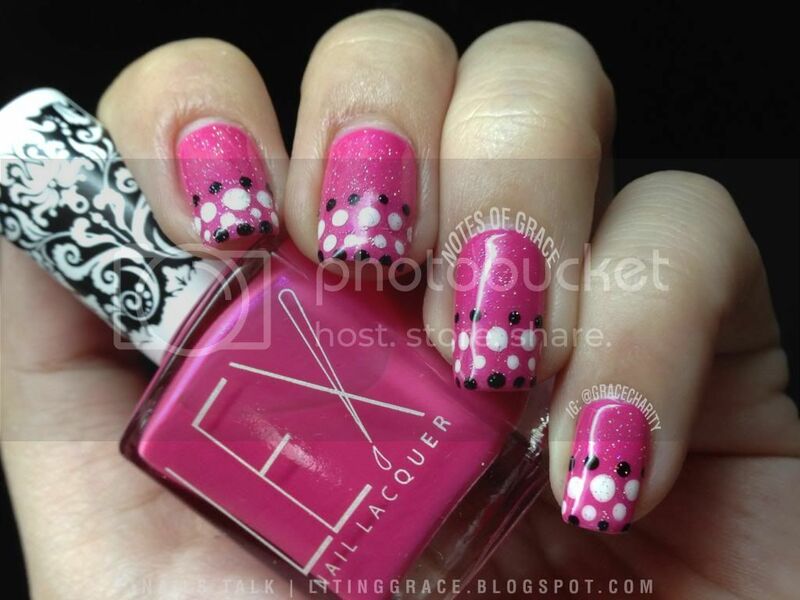 To complement the gorgeous packaging, I then decided it was time for my favorite dotticure. 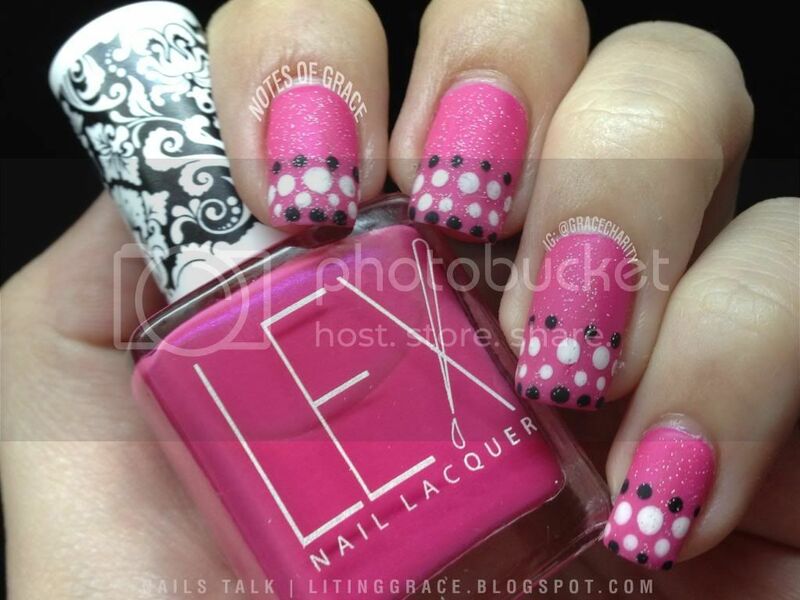 Using my dotting tools, I added dots to the tip of my nails with China Glaze White on White and Liquid Leather. 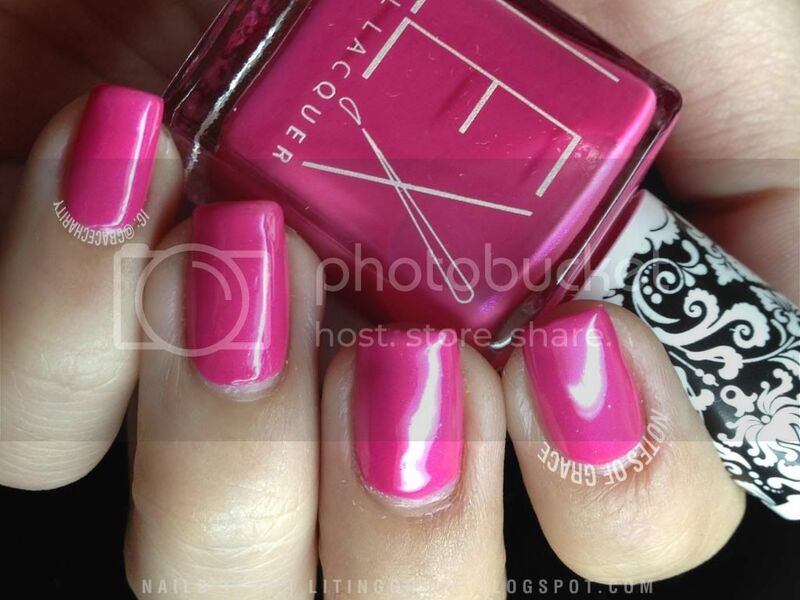 I then finished the look with a coat of China Glaze Fairy Dust and a coat of Seche Vite top coat. Please do pardon the slight streaking though. For a different look, I applied a coat of Essie Matte About You over it. This is something which I can see myself wearing when I get tired of the glossy finish. What's really cool about Love Me More is that, for every bottle sold, Mei Mei will donate SGD3.00 to a charity donation! Painting nails and yet able to still do your part for charity, why not right? Lex Cosmetics Love Me More is available exclusively at Mei Mei's Signatures with a retail price of SGD13.00 (inclusive of normal postage within Singapore). Don't forget that Mei Mei's Signatures also ships internationally. Do also follow Mei Mei's Signatures on Facebook for more updates.